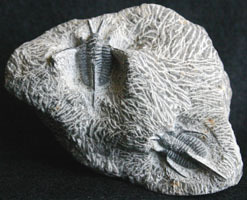 Trilobites were a highly diverse group of organisms that inhabited shallow sea floors and reefs during the Paleozoic Era. They belong to an extinct class of the phylum Arthropoda. The phylum name comes from the Greek words: arthron-meaning jointed and podos-meaning foot. 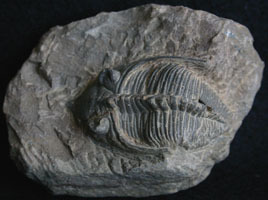 Trilobite means three-lobed and refers to the three lobes which run down the length of the trilobite's body. 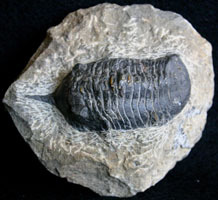 The trilobite's body is further divided into three regions: the cephalon (head), thorax, and pygidium (tail). The head and tail appear to be single pieces. All the body parts are held together with flexible joints which allow it to roll up for protection. 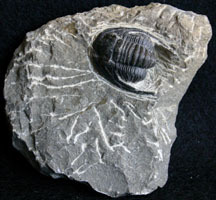 Trilobites were the first known animals to have the use of eyes. Some species had very complex eyes. 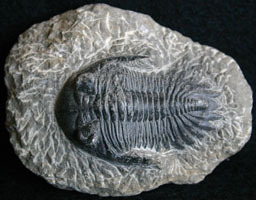 Trilobites also had many legs each equipped with a set of gills which seldom fossilize. Present day arthropods include lobsters, crabs, spiders, insects, etc. 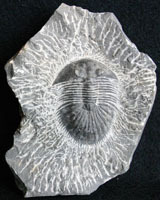 The first trilobites appear in the fossil record 570 million years ago at the beginning of the Cambrian Period. 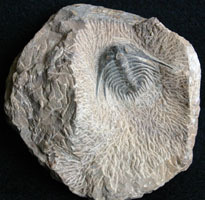 Trilobites became very numerous and reached their zenith during the Cambrian Period. 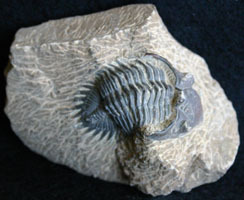 The number of trilobite species became reduced through several major extinctions. 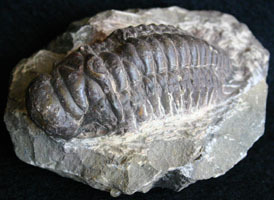 By the end of the Permain Period, 230 million years ago, the last remaining trilobites became extinct. 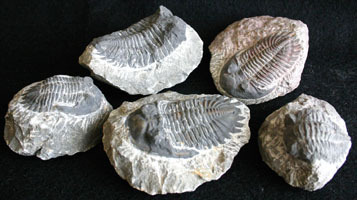 Trilobites along with cephalopods, and brachiopods are known as index fossils and are used by scientists to determine the age of certain layers of rock.